Botox injections have proven to be very effective in reducing wrinkles, frown lines, creases and fine lines on the forehead and on the face. In fact, Botox is one of the most popular form of treatment at our clinic. This treatment for wrinkles is safe, effective and quick and requires no downtime. Treatment is completed in around 15 minutes which means you can pop in during lunch hour and drive back to work or just continue normally with your day. Although this is generally considered a very quick and common procedure, we believe that its application is an art as it is a science. All Botox injections at our clinic are customized for individual patients and administered by skilled and experienced cosmetic doctors. Tailor-making the Botox injections according to patients’ individual needs enable them to retain control of some facial muscles if they wish to do so. This is ideal for people who want to achieve the “Baby Botox” look; a more natural and delicate look after treatment. 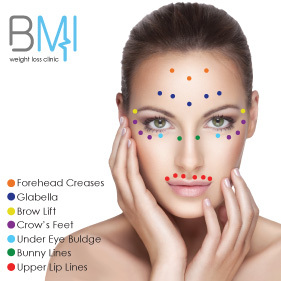 We also offer up to two weeks free follow-up with the doctor post treatment and a free Botox top-up during this time if needed to ensure that you are satisfied with your results. Frown Lines / wrinkles: These are vertical lines between the eyebrows that are normally caused by over-exposure to the sun and frowning. Small injections along and between the brow have been licensed to reduce these wrinkles. Crow’s Feet: These are wrinkles formed around the eyes caused by loss of elasticity and sun damage and are more visible when one smiles, squints or laughs. Small Botox injections around the corners of both eyes usually lessen the appearance of these wrinkles. Forehead Wrinkles: These are wavy horizontal lines on the forehead that become more visible when the eyebrows are raised. A few small injections on the forehead treats and reduces forehead wrinkles. The Chin: As we become older, our chins tend to become more dimpled and appear bigger. A few Botox injections on the chin reduce these dimples and make the chin look less bulky. Smoker’s Lines: These are lines that form above the upper lip and around the mouth area. They can appear both in smokers and non-smokers but tend to be more prominent in people who smoke. When Botox is injected around the top lip, the smoker’s lines become less visible. Bunny Lines: These are wrinkles and creases that form on top of the nose. They mostly become visible when one squints or frowns. Their appearance can be significantly reduced with a few small Botox injections. Marionette Lines: These are lines formed around the lines that make people assume a sad appearance as they grow older. These wrinkles can be easily reduced with a few Botox injections. This will significantly enhance one’s appearance. Brow Lift with Botox® Injections: When Botox® injections are carefully applied around the brow, they can lift the eyebrows; opening up the eyes. Also known as the Chemical Brow Lift, this procedure gives women a more youthful look. Masseter (cheek) Botox®: Some people have large cheek muscles. This gives them a square and bulky jaw. Applying Botox® injections on the masseter muscle softens the jaw line and reduces the bulky and square appearance of the jaw. This treatment can also benefit people who grind their teeth. For more information about Botox® and wrinkle treatment or to book an appointment, give us a call today.